Today I’m sharing halawet el jibn, or sweet cheese rolls. Arabs LOVE to add cheese to their desserts. If you’ve never had it, once you try it, you’ll never go back. In these desserts, they use a special kind of cheese that is melty, unsalted and sometimes seasoned with mahlab. These cheesy desserts are my all-time favorite. Traditionally, Middle Eastern desserts are almost never prepared at home. They’re left to the experts in professional bakeries, where recipes are guarded for life. When my parents moved to the United States, there weren’t any of these bakeries around. Like many other families who found themselves away from their homeland and their neighborhood favorites, my mom learned to make this delicious dessert, and it’s probably one of her most requested items. The flavors are quintessentially Middle Eastern, delicate and fragrant. The dough is made by combining semolina, milk, cheese, sugar and orange blossom water. The clotted cream filling (qashta) uses mastic and rose water, which is my favorite combination. Many people use less sugar in the dough and make a syrup to drizzle on top. My mom realized that more sugar in the dough without syrup yields the perfect balance of sweetness, and she couldn’t be more right. Without further ado…halwet al jibn (sweet cheese rolls)! A sweet semolina and cheese dough with clotted cream filling. 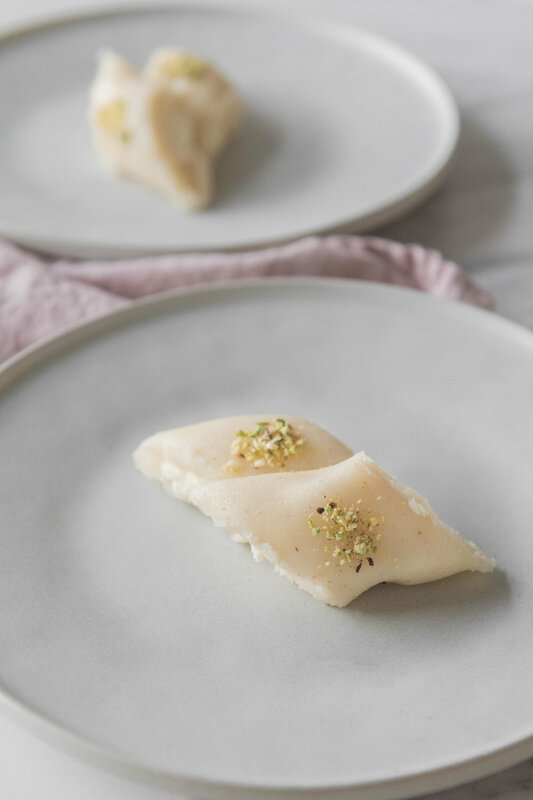 A quintessential Middle Eastern dessert flavored with fragrant orange blossom, rose water and mastic. Use a white cheese that easily melts, like Akkawi or Nabulsi, either unsalted or lightly salted. If lightly salted, be sure to soak overnight with warm water, changing the water a few times. Squeeze out all the moisture before adding to the dough. The rolls can be prepared up to 1-2 days ahead. Once sliced, store in an air-tight container in the refrigerator up to 5 days. Make the clotted cream (qashta) by adding the milk to a large saucepan over high heat. Dissolve the corn starch in the half and half or whole milk in a small bowl. When the milk starts boiling, add the corn starch mixture and mix continuously until smooth. Take off the heat and add mastic and rose water. Place in a heat-resistant container, cool slightly, then cool completely in the fridge for several hours, up to 2 days. For the dough (halawe), combine the sugar and milk in a large pot set over high heat. Stir continuously until the sugar dissolves and the milk comes to a boil. Add the cheese and the orange blossom and continue stirring. When the cheese starts to melt, add the semolina and keep stirring until combined and cheese is fully incorporated. Spread several pieces of plastic wrap onto your work surface, about 18 inches long. Scoop about 3/4 c of halawe dough onto the plastic wrap and cover with another piece of even size. Roll out to a long rectangular-ish shape, keeping the edges as even as possible. Uncover top layer and place about 3 Tbsp of clotted cream on the end of the halawe closest to you. Spread across evenly. Roll tightly by lifting the plastic wrap and bringing the halawe over the cream. Continue rolling then cover with the plastic wrap and set aside. Continue with remaining halawe and refrigerate overnight. When ready to serve, slice the halawe on an angle into even pieces. Sprinkle ground pistachios in the middle of each piece. Store in an airtight container in the refrigerator up to 5 days.